Like any Singaporean living overseas, Alicia Lin craved a taste of home. She spent 20 years honing her skills cooking Asian food while she was living in America. Now that she’s back in Singapore, she’s missing a taste of the states. Creating Chow Fun was her answer. 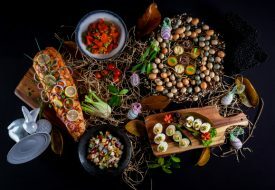 The small plates bar blends both Asian and Western cuisine. The name Chow Fun is also inspired by the Cantonese fried noodle dish served at Chinese restaurants in America; not what we call fried rice in Singapore. 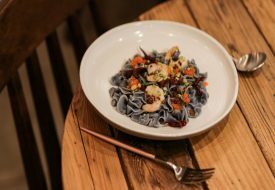 In fact, Alicia much prefers noodles over rice, creating a menu that has over 18 types of noodles served in small portions so that diners can have a taste of more. Chow Fun is decked out in vibrant chinoiserie hues, making you feel like you’ve stepped into a quaint cafe in Chinatown. Grab a seat and you’ll find that this is one of those cozy places you can spend hours unwinding at with friends over a couple of beers. 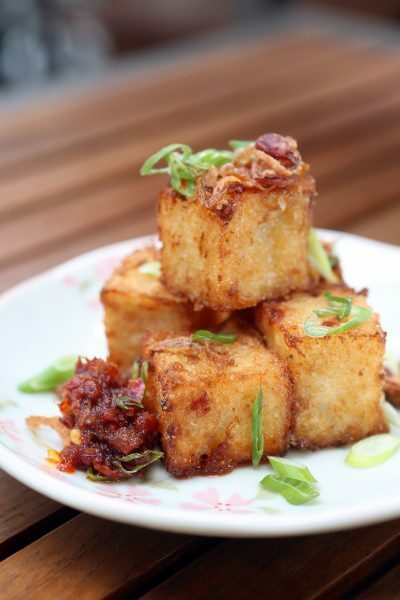 There are all-day happy hour offers and excellent bar bites like Sous Chef Joven’s homemade Mom’s White Radish Cake ($5.90); crispy on the outside and soft on the inside, Joven’s rendition of chai tow kway stands up to even the best hawkers. My favourite dish from the snacks menu was the Potato, Bonito and Cheese Pancake ($5.90). Slices of potato are sliced thinly to make the base of the crispy pancake before it’s topped with a decadent combination of melted mozzarella, mature cheddar and grana padano cheese. The finishing touches of bonito flakes, okonomiyaki sauce and spring onions resulted in a umami-bomb that will leave you wanting more. As for the stars at Chow Fun, each bowl of Asian and Western-inspired noodles are priced at an affordable $2.90 per bowl. Depending on your appetite, you’ll probably need three to five bowls to feel comfortably full. 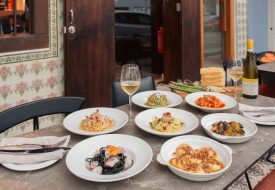 The small plates concept is a great way for diners to try a variety of dishes, while those who know what they want can opt for a larger portion of their favourite noodles. Having tried nine out of the 18 available flavours, we recommend the Ginger and Scallion rice noodles for those who want something light and refreshing; the Wild Mushroom and Truffle penne for those who like classic flavours you can’t go wrong with and the Tom Yum Cream for people looking to inject some spice into their lives. 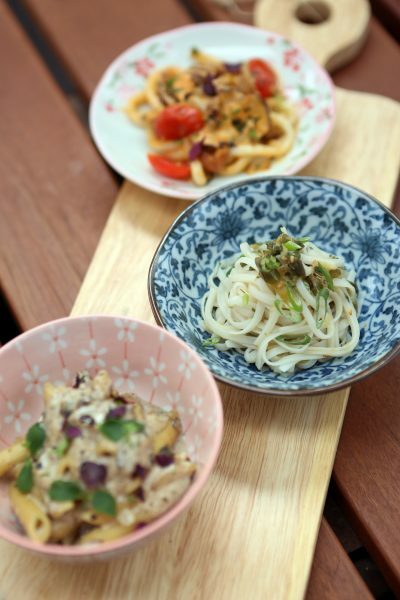 Dive into a selection of over 18 Asian and Western-inspired noodle small plates priced at an affordable $2.90 per bowl. A familiar classic is the Wild Mushroom and Truffle pasta. A large amount of shiitake and dried porcini mushrooms are sautéed and mixed with cream and milk to achieve a rich sauce brimming with earthy flavor. An accentuated touch of aromatic truffle oil is added to finish the dish. 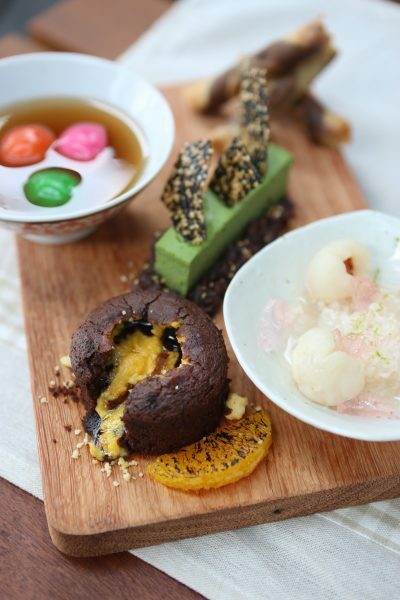 Chow Fun is a lively yet intimate space to relax with friends and bond over simple good chow and dessert. Their in-house dessert chef can be seen working her magic near the bar, inviting you to try some of her creations like the Deep-fried Caramalised Banana Fritters ($6.90) or their Salted Egg and Chocolate Lave Cake ($8.90). Trust us, you won’t regret the extra calories. Chow Fun Restaurant and Bar. The Grandstand, 200 Turf Club Road, #01-08, Singapore 287994. Tel: 6464 6900.